Most of us based on our geographical location might have seen large groups of geese migrating while flying in a V formation. Other of us might have only seen this in books or on the television. This formation can be seen when they migrate from their summer homes in Canada, around late fall (autumn) and early winter, to the warmer climate of the southern United States. You may have wondered why they choose this particular regular V-shaped formation pattern. Everything in nature is done for a particular reason even though we might not see the obvious reason for such. Nature teaches us a lot of things, and if we could only just take some time out of our daily busy schedule to ponder, learn and understand things around us whether it be an ant, a plant, a bird, our general surrounding and so on, we would be much more wiser individuals and leaders in this world. This article will therefore answer the question above and also quickly look at how we can learn and apply this natural phenomenon to better our daily lives. So, why do they fly in this particular formation? 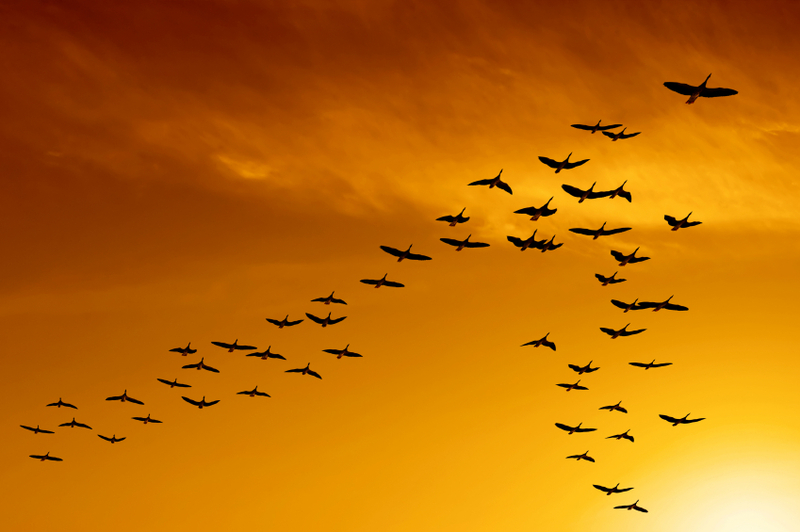 Over the years scientists have came up with theories of why migratory birds such as geese fly in a V-shaped formation. A study done some time back also shed some light on this particular V formation. This study discovered that birds flying in a V format had lower heart rates than bird flying alone. Why? The aerodynamic V shape formation reduces the air drag (air resistance) that each bird experiences when in flight in comparison to a bird flying solo. This allows them to cover longer distance (thousands of miles) with much less effort. For example, geese can achieve a greater distance of about 70 percent when flying in groups than each flying solo, using the same amount of energy. In this formation, the bird in the lead position will experience a greater air resistance and will have to work a little harder, however, when the lead bird is tired it falls out of position and goes behind into one of the V position lines. Another bird from behind will then quickly move forward into the leading position thus, maintaining the V formation. The same happens for those birds in trailing positions especially those at both extreme ends of the V formation, since they tire more quickly than those in the middle. This cycle continues as they travel to their destination. Thus each bird gets the opportunity and responsibility to be in the lead position as well as enjoying the middle position since less air drag is at this position. This enjoyment of less air resistance comes as a result of the birds in front creating and improving the aerodynamics of the others behind which continues along the line of V. In other words, this formation breaks up the air, which then flows over the rest of the group more easily. This means all birds benefit individually while working harmoniously as a team. Working as a team means less work for each bird because flying requires a lot of energy especially for birds traveling a very long journey. This formation therefore help migratory birds such as the geese to use their energy efficiently and effectively to achieve one goal – to reach there destination. All members of the team plays their part and mutually benefits from this. How do they keep this formation? If a bird should shift out of position then that bird will suddenly feel the air drag of going solo and quickly get back into the line of formation. This demonstrates how team work plays a very important and useful role in nature. There are other benefits of flying in this V position. Every bird in the group fly in the field of vision all other members. This helps in keeping track of each other in the group. This also makes it conducive to the members in the group to communicate with each other while in flight. For example, if one bird should become sick or has been injured by some means such as being shot, then, that bird will fall out of formation. This will then result in two other geese falling out with the wounded goose to help and offer protection and will remain until that bird recovers or dies before rejoining the others. 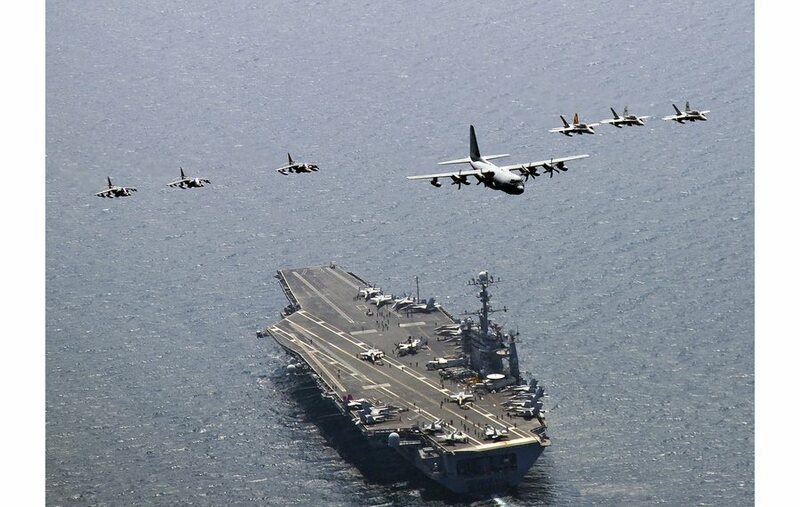 It is important to note also that military jets fly in this V formation for the same reasons. Each fighter pilot can see, communicate and help each other while in flight working as a team. Also, NASCAR race car drafts another car to reduce the air resistance on their car.